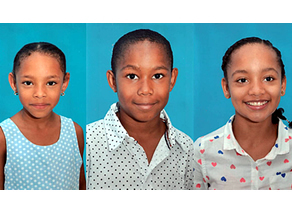 Siblings Diana (age 8), Rick (age 9) and Amy (age 13) are currently living in a foster home together. They would very much like to be adopted together by one family. These siblings have always lived together and do not want to be separated. Diana is in the first grade. She likes math and English classes. She expresses her feelings easily and loves making new friends. Diana enjoys swimming, drawing and arts & crafts. Rick is in 4th grade; he is a very calm and respectful boy. Rick enjoys bicycle riding, playing soccer and playing the guitar; he is currently taking guitar and dance lessons. Amy is in the 7th grade. She is a very responsible girl who likes to study and is attending music school, where she is learning to play various instruments. Amy has good relationships with her peers and loves to study Spanish and science. She would like to study law or become a doctor.